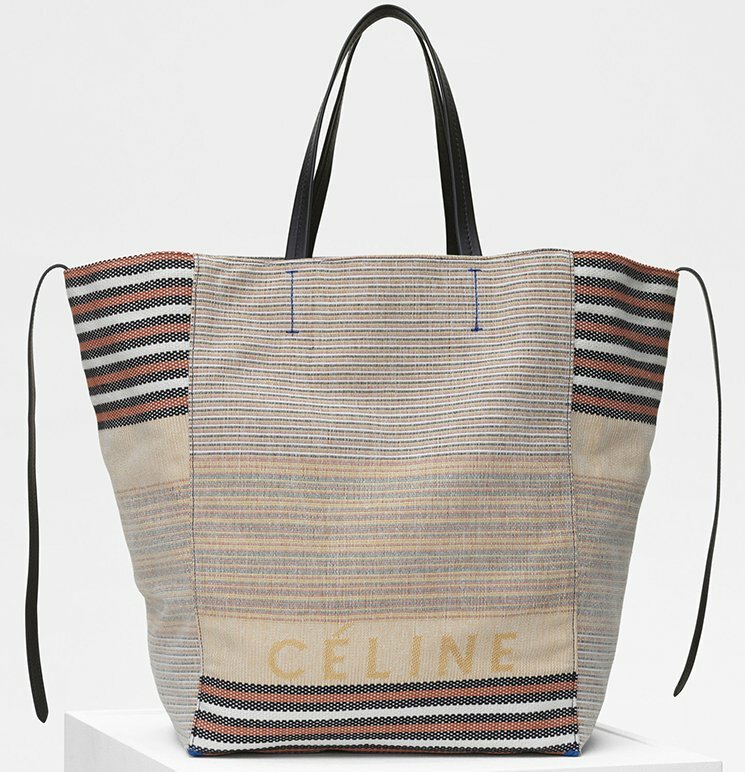 The Celine Cabas Phantom Bag doesn’t need any introduction. 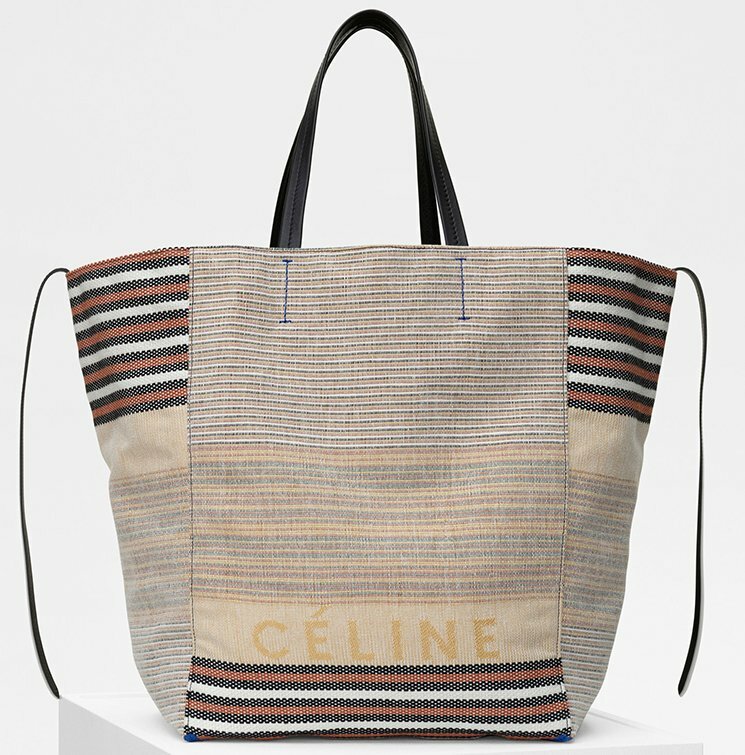 This bag is as iconic as the Luggage Bag or the Trapeze Bag. It’s beautiful, daring and above all, spacious beyond our dreams. However, for the Spring Summer 2018 Collection there are new styles available. If you’re not into the solid colors, then perhaps these multicolor designs can help you make the right decision. The multicolor mixes and material used, makes this bag feel like back in the 80’s. The horizontal stripes are painted in multicolor and very lightly designed. 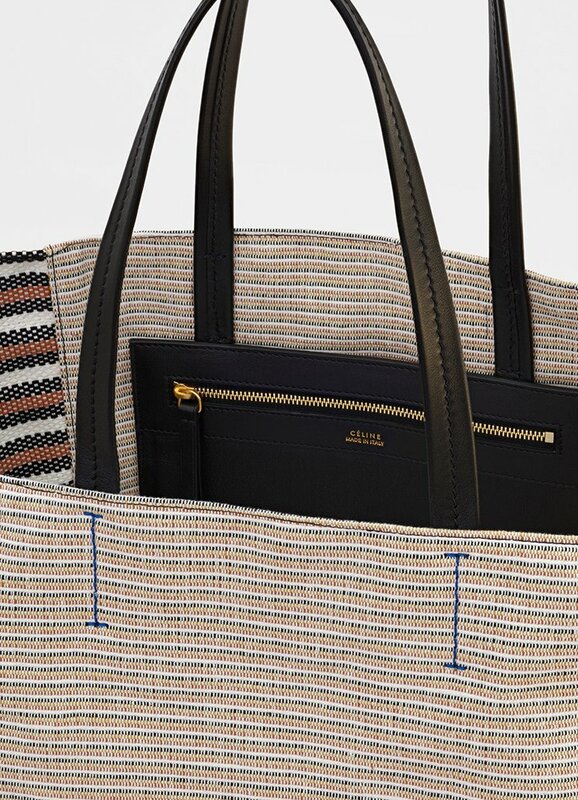 It’s a stunning handbag, especially the Cabas Phantom Bag with the house’s logo crafted on the front. The Cabas Phantom Bag comes with two expandable side wings for extra storage and also a leather strap for practical and decoration purpose. It features two strong leather handles for hand carry or shoulder carry. And what’s more important is that they’re made from Cotton and Textile. Leathers are more luxurious, but these materials are very strong. The inside features one large main compartment, a zipped pocket and a double flat pocket. 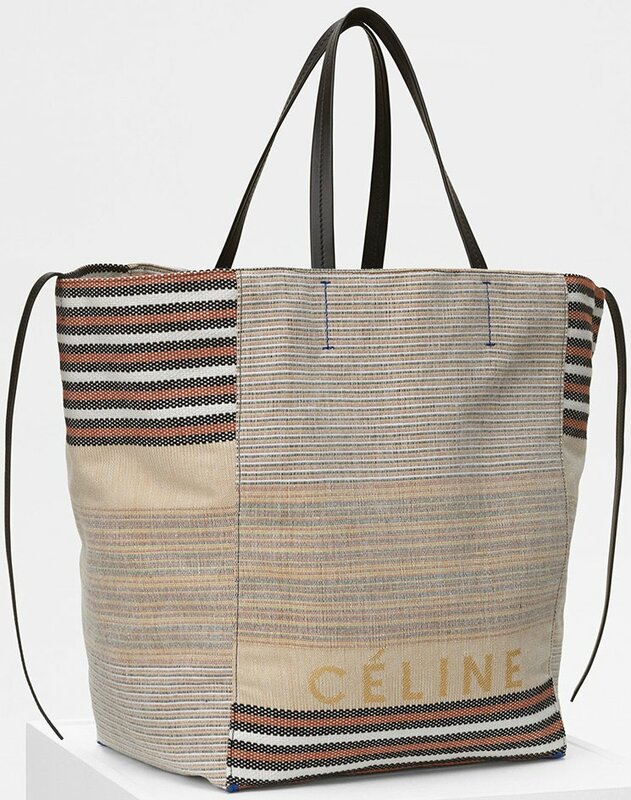 The bag has a lot of room and it’s perfect for daily use or as a shopping bag. Measuring 12’ x 15’ x 9’ inches, priced at $1850 USD, €1300 EUR, £1200 GBP, $2400 SGD, $14500 HKD, $2300 AUD, ¥210000 JPY, 13500 CNY via Celine boutiques. Actress turned designer Sarah Jessica Parker teams up with Gilton an exclusive bridal collection. The SJP by Sarah Jessica Parkerline offers up ten pieces ranging from bodysuits to dresses and skirts. Available in white, pink, blue, red and black, prices start at $295 and go up to $2,395. Beading, feathers, bow accents and pleating decorate the elegant designs. 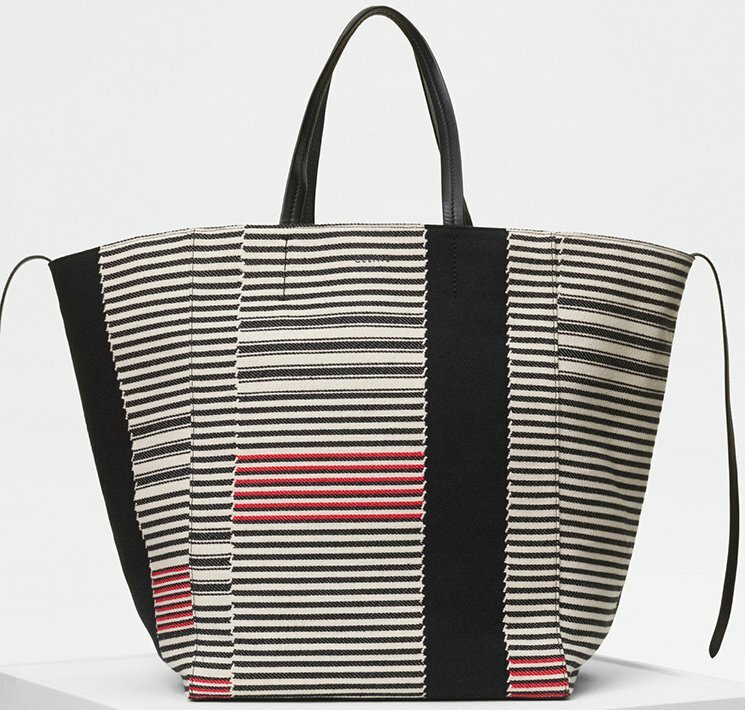 See some of our picks from the collaboration below, and shop more at Gilt.com. Whether for the ceremony or reception, a white jumpsuit makes for a chic bridal look. A pleated skirt features a banded waist as well as an A-line silhouette. 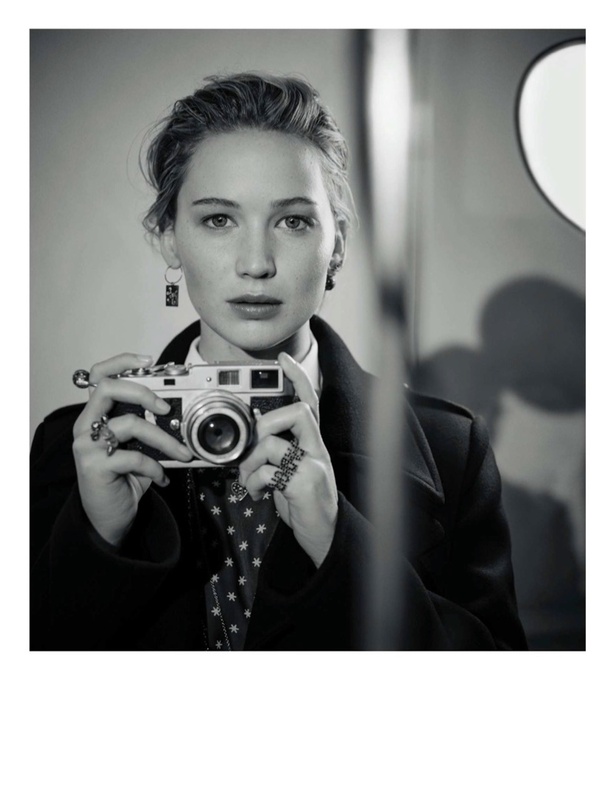 Following up her resort advertisements, Jennifer Lawrenceappears as the face of Dior's pre-fall 2018 campaign. The American actress poses in relaxed styles designed by creative director Maria Grazia Chuiri. The new season spotlights handbags with gold hardware, embroidered logos and embellished straps. Captured on a minimal set with visible lighting, the blonde also poses with a camera in hand for a few shots. For beauty, Jennifer wears her hair in a tousled updo with natural looking makeup. We knew it was coming; it was just a matter of time. Meet the Chanel Boy Square WOC from the Spring Summer 2018 Collection Act 2. So the last time, we talked about the Chanel Classic Square WOC and we did a comparison with the normal WOC. It’s a must-read article! Just for the information, there are certainly more leathers, colors and styles available via the boutiques. Check with the SA’s. A quick summary – what’s the Square WOC? The Square WOC is actually like the normal WOC’s, but it has a different shape. The interior is different as well. For the full comparison, read this article: Chanel Square WOC versus original WOC. The Boy Square WOC features the same elements like the original Boy WOC. It comes with a front flap and the edges are striped. The center is crafted with the iconic Boy Clasp. You can carry the bag on your shoulder with the woven chain leather strap. Or even cross body. This bag is taller than the original WOC, but it’s smaller in width. The Boy Square WOC measures 5.7’ x 6.7’ x 2.4’ inches while the original Boy WOC measures 4.8’ x 7.6’ x 1.4’ inches. I really like the Square WOC as it gives you a unique yet fresh experience. And by the way, not a lot of people are carrying this bag right now. The interior of the Boy Square WOC is different than the original WOC. Inside you will find a zip pocket, central compartment and credit card slots. The structure is not the same though. And also, it can fit an iPhone 7+. The style code is A84433, measuring 5.7’ x 6.7’ x 2.4’ inches. 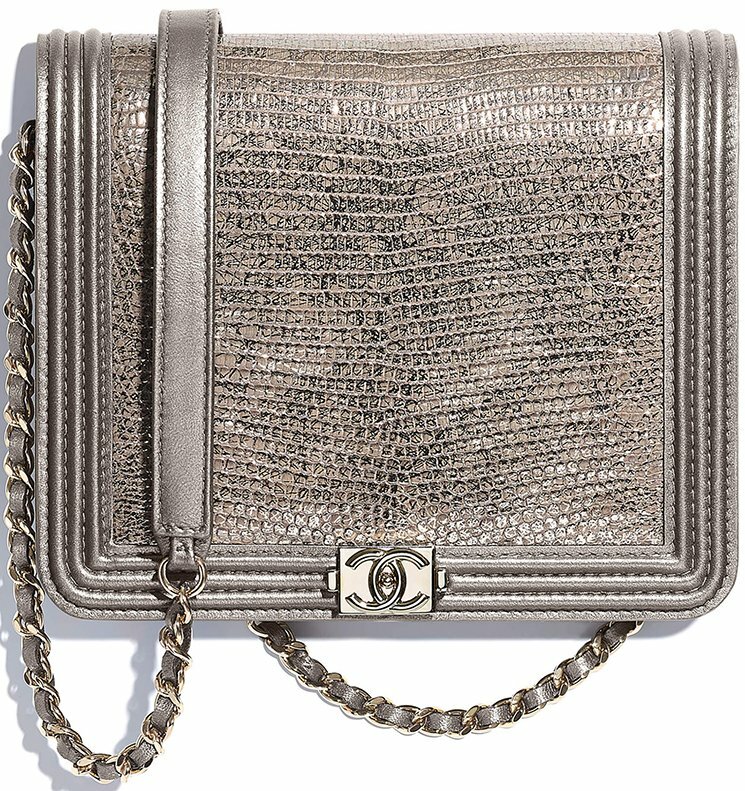 The lizard version is priced at $6300 USD, €5350 EUR, £4810 GBP, $8990 SGD, $47000 HKD, 27360 MYR via Chanel boutiques. Valery Kaufman turns up the heat as the face of Natayakim Swim. The Russian swimwear brand spotlights sleek silhouettes for its summer 2018 campaign. Photographed by Txema Yeste, Valery smolders in every shot. The brown-haired beauty poses in metallic bikinis, one-piece swimsuits and branded beachwear. For beauty, Valery wears her hair in beachy waves with a sun-kissed glow.